WACO, Texas (AP) — Corey Coleman had two more touchdown catches, Shock Linwood ran for 171 yards and second-ranked Baylor stretched its FBS-best home winning streak to 20 games. Yet, these weren’t the point-a-minute Bears everyone has been used to seeing this season. 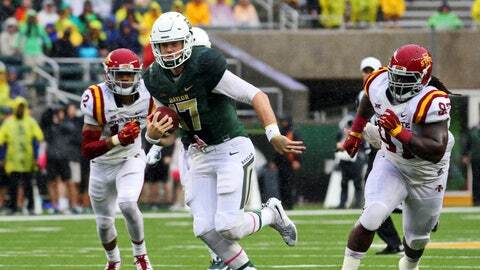 On a dreary and rainy day along the Brazos River, Baylor was held under 60 points for the first time in six games, but never trailed in a 45-27 victory Saturday over Iowa State. "It’s hard to stay at a level that we’ve been at, energy-wise, emotionally and then production-wise," coach Art Briles said. "It’s been insane." The only other NCAA team with five consecutive 60-point games was Oklahoma in 2008. The Bears (7-0, 4-0, Big 12) had 485 total yards, leaving them well below their national-leading averages of 64 points and 720 total yards a game. "We’re going to take the blame, but the weather was bad, and we couldn’t do lot of stuff we usually do," Coleman said. Baylor led 35-0 by the middle of the second quarter before going more than 35 minutes — the equivalent of more than a full half — without a single point. "A tough win, but I think it was a win we needed," Briles said. "You hate to say that, you’d like for everything to be like it’s been. It’s not going to be that way, it’s not reality. I thought our guys did a great job of just kind of sustaining, and maintaining, and not panicking and just taking care of business." Baylor finished the game without quarterback Seth Russell, who sustained a strained neck on a 4-yard run without about 5 1/2 minutes left. The extent of the injury wasn’t known, though there is extra time before the next game. "He’s a tough guy. It’s hard to see tough guys hurt," Briles said. Coleman had a 36-yard score on Baylor’s opening drive, then had a downfield block that helped Russell break free on a 37-yard TD run for a quick 14-0 lead. Coleman caught a 12-yarder from Jarrett Stidham in the closing minutes, his FBS-best 18th TD catch this season and the 31st of his career to break Kendall Wright’s school record. Russell was 16 of 37 for 197 yards and two touchdowns, pushing his FBS-leading total to 29 scores. "It was kind of tough catching the ball," Coleman said. "It’s kind of hard to play when the ball’s waterlogged and (for Russell) to try to throw the ball like a shotput. … It was an ugly win, but we got it." Iowa State (2-5, 1-3), which has lost its last 14 games against ranked teams, was within 35-20 on Joel Lanning’s 4-yard TD pass to Jauan Wesley with 7:47 left. "We had an opportunity to get an onside kick and pull this game within seven and put ourselves in a position to compete to win," coach Paul Rhoads said. "You do that on the road in conditions like this against the second-ranked team in the country, you’re pleased with the energy and effort they gave." Mike Warren had his fourth 100-yard rushing game for Iowa State, with 145 yards on 28 carries. Joshua Thomas, another freshman, ran 13 times for 77 yards and a score. When Russell threw a 6-yard TD pass to Linwood to make it 28-0 early in the second quarter, Baylor’s junior quarterback had 29 passing touchdowns and six rushing TDs. That is exactly what Bryce Petty had in his 12 games last season for the Bears before being drafted by the New York Jets. Baylor hasn’t lost a home game in more than three years, since a 49-21 loss to TCU on Oct. 12, 2012. That home winning streak includes all 10 games since moving into their campus stadium last season along the Brazos River, swollen so much Saturday after nearly 14 inches of rain in the area over a two-day period that officials had to prohibit sailgating — Baylor’s version of tailgating on boats. With an open date next weekend, Baylor played its last game before the initial College Football Playoff rankings of the season come out Nov. 3. The Bears, the two-time defending Big 12 champs and first team left out of the first CFP last season, play two nights later at Kansas state. "Yeah, I’m curious," Briles admitted about the first CFP rankings. "I’m not sure how much my curiosity is going to change anything. I think it’s been proven it’s got zero effect."